The creation studio of Cartier filed an intellectual property lawsuit against Lugano, a California jeweler. 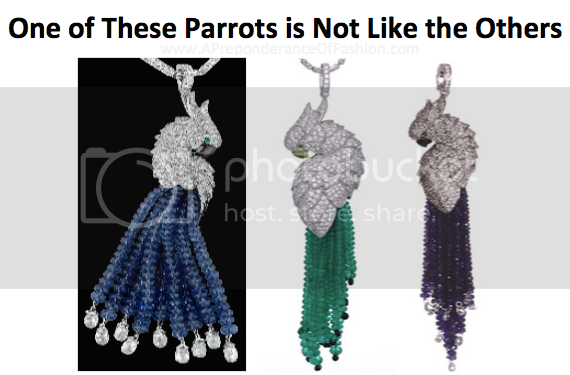 Cartier claims that Lugano Diamonds is selling jewelry that purposely infringe Cartier’s copyrighted Parrot Necklace and patented Panthère Design. The original and mimicking parrots are pictured below. Cartier is 1 on left. Others are Lugano Diamonds. You can see Lugano’s blue bead version on its Facebook page (here). Cartier became aware of Lugano from a lookalike parrot advertisement. The following month Cartier sent an agent to Lugano’s Newport Beach store. The agent discovered that the parrot sold for $68,000. Should Cartier’s intellectual property rights be upheld? Cartier suggests Lugano’s parrot necklace is an identical copy. Similarities include “identical” unusual posture, proportions, diamond-encrusted hanging loop, emerald eyes, and beaded plumage finished with contrasting pearl end-stones. Lugano Diamonds informed Cartier’s agent that any Cartier product could be reproduced at a cheaper rate than priced at Cartier. Many independent jewelers provide this service but it is not an acceptable practice. In its prayer for relief, Cartier requests business records and destruction of infringing materials and means for manufacturing the infringing materials and a recall of distributed infringements. Cartier also requests that materials (possibly diamond encrusted pieces) are delivered to their attorneys for destruction. Follow my Twitter for further updates on this case and other fashion law topics. This Cartier fashion law complaint is available here.